Brita Hall is an accomplished athlete, having stood on a podium more often than most, with six Special Olympics World Games gold medals to her name.She is truly a “Golden Girl” - full of energy, very active and her smile is infectious. “Everybody loves Brita and Brita loves everyone,” said Special Olympics Manitoba – Past President & CEO, Simon Mundey. In 2013 a small ceremony attended by family and friends, Hall’s photo was placed on the “Wall of Fame” in the offices of Special Olympics Manitoba. One of the first athletes ever to be inducted, Hall has been active in Special Olympics for 35 years, competing in both summer and winter sports on provincial, national and international levels. In 2004, Hall was named Female Athlete of the Year for Special Olympics Manitoba and in 2005 was named Special Olympics Canada, Female Athlete of the Year in Toronto. When Hall was only nine weeks old, a car accident changed the course of her life and the lives of her parents forever. Doctors gave her only a ten per cent chance to ever walk or talk. Indeed, she didn’t take her first steps until she was almost five years old―but then a miracle occurred. Her parents put her feet inside a pair of ice skates that same year―and she started skating almost immediately―and skating well. Something about the physical exercise and Hall’s own motivation literally moved her forward in her development. Not only was she skating, but also running at top speed. In 1980, Hall competed in her first Provincial Summer Games, in Pan Am Stadium at the University of Manitoba in Winnipeg. She took gold in the 800m race, beginning her award-winning record of achievement. Hall’s first International Winter Games came in 1993 in Austria, where she won two gold medals and one silver medal in cross-country skiing. In 1994 she was part of the Canadian Paralympics Team in Lillehammer, Norway, and came 4th in cross-country skiing in the intellectually disabled category and placed 4th in the sport at the 1998 Paralympic games in Nagano, Japan. In 1997, the Special Olympic World Winter Games were held in Toronto, where she won a gold and two silver medals in cross-country skiing. In 2005 Hall was back in Nagano with Special Olympics and again won one gold and two silver medals in cross-country skiing. And in 2009 she competed in Boise, Idaho, in the Special Olympics World Winter Games and came home with another gold and two more silver medals. In 2003, Hall competed in track and field at the Special Olympics World Summer Games in Raleigh, North Carolina, where she earned one silver and one bronze medal. In 2007, she was part of Team Canada at the Special Olympics World Summer Games in Shanghai, China, where she again won a gold medal. In 2014, she competed at the Special Olympics National Summer Games in Vancouver in the 1500m, 3000m and 5000m races. Before athletes can participate in international games, they have to compete in Provincial competitions, in each sport different criteria will qualify an athlete for a national or international games. Hall easily met the criteria, allowing her to be added to Canada’s national teams in world-class international venues. Despite her normal Monday to Friday work schedule, Hall makes the time to train five times each week at the Max Bell Centre and runs during her lunch time. Throughout her remarkable athletic career, Hall has received eight “Gold Award of Excellence in Sport” honours from the Province of Manitoba. In addition, she has been the recipient of three levels of the “Duke of Edinburgh Award,” which is designed to encourage youth to set and achieve goals through self-development, self-training and personal achievement, based upon individual effort and improvement. She was the first athlete to be awarded a life-time achievement award on behalf of Special Olympics Canada. She was presented with the Bronze Award by Winnipeg Mayor Bill Norrie, the Silver Award by Lt. Governor George Johnson and the Gold Award by His Royal Highness Prince Edward when he visited Winnipeg in 1990. She was the first person with an intellectual disability to ever receive these awards in Manitoba. Where is Brita now? She is still as active as ever, a member of the Navvies Track Club and a skilled cross-country skier. 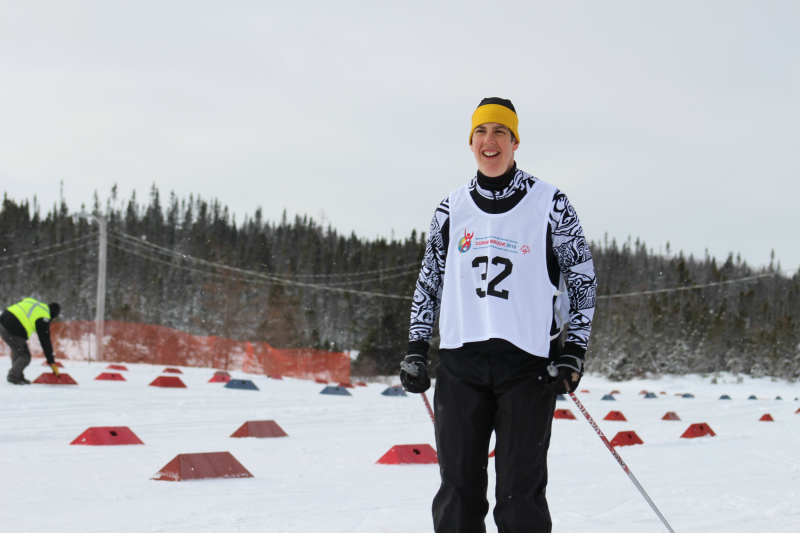 She most recently competed on the national stage in Cross Country Ski at the 2016 National Winter Games in Corner Brook, Newfoundland. She is currently training in preparation for the 2018 National Summer Games in Antigonish, Nova Scotia which take place this August. Brita is excited to compete on the provincial athletics team and is ready to make Manitoba proud! You'd be hard pressed to find anyone involved with Special Olympics Manitoba who doesn't know Brita. Her smile still lights up every room she steps into!